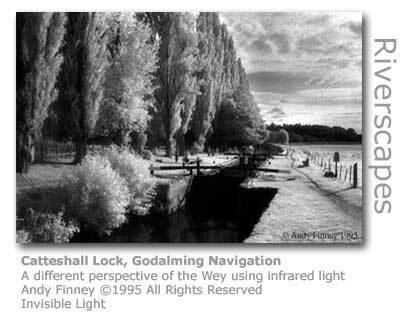 When the Godalming Navigation was built one hundred years after the Wey Navigation it effectively extended the extent of the navigable waterway by four miles to reach the prosperous town of Godalming, then a considerable industrial centre especially for the clothing industry. The first small town lottery in England launches in November 2008 to help good causes in the town. The much admired oak tree has much to share apart from its natural beauty. Apart from having provided wood for the shipbuilders that were furnishing the massive medieval English navy with their fighting ships, the noble oak has an important secret. Over 300 different species of insect and small animals make direct use of the tree in some way, the highest of any tree in Britain and is in effect a whole habitat in its own right. An instructor at the Go Godalming Youth Canoe Club has been officially recognised (July 2007) for his tireless efforts in inspiring young canoeists to win British Canoe Union certificates in canoe proficiency. John Richardson was presented with the award on behalf of the local community. Lisa Cooney, who has lived in Farncombe and Milford all of her life, was nominated for the Mumpreneur Awards 2011. Her business Out of Love, which had been running for a year, sells home accessories online. Mumpreneur highlights the successes of 'mums in business'. The wholly surrealistic sight of aeroplanes being transported by barge along the Wey Navigation provided the residents of Byfleet and Weybridge with some gossip over a pint or two after the First World War. The planes had been built at nearby Brooklands and had become redundant once the war was over. A total of 37 aeroplane cargoes were moved this way. "Mist lies over the Lammas land below Godalming wharf as we return to Herbie bearing a two pint carton of Elsie Mo bitter from the rather wonderful Star Inn in town. A bat is circling the boat outside and as we approached the boat a fox scuttled across the moorings in front of us. Earlier this evening the horse pulling the trip boat Iona passed us as its handler deftly lifted the tow rope over Herbie’s chimney. This is the end of the navigable Wey. We got a good soaking as a sudden thunderstorm hit us as we approached Farncombe, the heavens opened and we had no place to pull in and shelter for several minutes. Up until then we’ve had a lovely day. The Wey Navigation is all you would expect of a place run by the National Trust (which it is). It is green, well maintained and full of rustic charm. Often, I felt we were in a Constable painting as we approached an old wharf amongst the hay fields. I kept waiting for the grotty bits, but there weren’t any. In the estate agents window in Godalming some nice little cottages were a snip at £1.25 million. "Even Guildford was nice, especially the bits after the town centre. 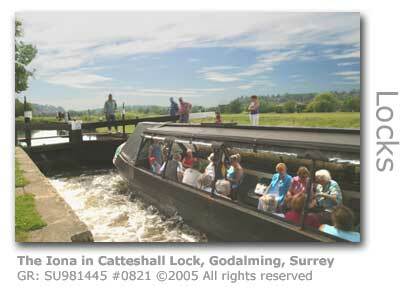 Tomorrow we will return there to join the annual boat gathering, I hope we can get under the bridge at Shalford. Today we had barely an inch of clearance over Herbie’s chimney and it has been raining since, so the river may be higher. A Farncombe resident has challenged the council's claim that Waverley traffic calming schemes have helped cyclists. David Kirkham has highlighted the fact that four recent schemes have made the roads more dangerous. 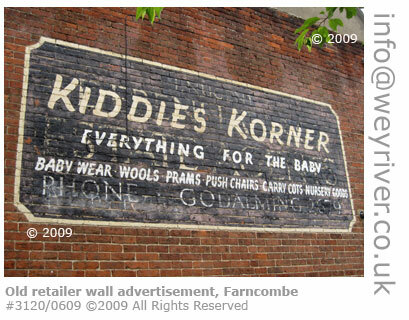 "Farncombe is my choice. Lived here for 3 years and love it! It's got lots of amenities, takes only 40 mins to get to London by train, has Godalming and Guildford within a 5 minute journey, yet the cost of houses and flats here haven't become as expensive as G or G (yet!!) Farncombe definitely gets my vote! " "Godalming and its surrounding villages of Milford and Farncombe are lovely: plenty to see and do yet within easy reach of London, which probably accounts for the cost of properties being so expensive. Beautiful area to live." "As we arrived in Godalming, the first thing was finding a mooring because there did not seem to be any of a suitable size for Hadar, well that was until NB Belle moved off and we moved from the sanitary point to their mooring. 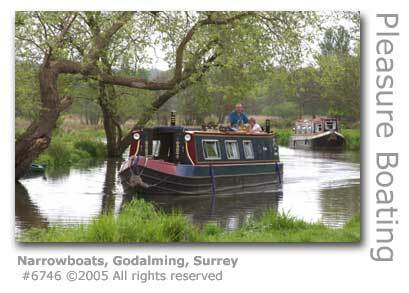 Having moored up at 12.15pm and had lunch we then took a walk into Godalming. It is a very pretty town, with a lot of very old buildings, with a great deal of character. Keith and I enjoyed a walk around the very small museum, which is free to enter. As with all towns we visited the charity shops, but there was nothing that caught our eye. The efforts made by the Community Street Team in Farncombe to bridge the attitude chasm that has developed between adults and youths have inspired other groups to be set up in the borough. The scheme, devised by youth crime prevention workers at Surrey County Council, involves volunteers taking to the streets to engage in conversation with disaffected youths. The team in Farncombe take it in turns on a three week rotation and hit the streets with a rucksack of popcorn which is used to strike up conversations. Broadcaster Sandi Toksvig spent a few hours on the Godalming Navigation as part of Radio 4's Excess Baggage series (2008). A special effort was made (April 2009) to celebrate the 150th anniversary of the first direct rail link between Portsmouth and London when the 70013 Oliver Cromwell steam train hauling 11 coaches travelled from Havant near Portsmouth to Yeovil with passengers bedecked in Victorian dress purchasing commemorative tickets for just one pound return. The Direct Portsmouth Railway connecting Havant and Farncombe allowed travellers between Portsmouth and Waterloo to make their journey by the most direct route via Guildford, rather than via Eastleigh or Chichester, and although the commemorative journey did not encompass the local railway line the original disputed 19th century link was between Havant and Farncombe. "Until 1859 rail travellers were unable to travel between Portsmouth and London via Guildford without travelling on a stagecoach due to a dispute between London and South Western Railway and the London, Brighton and South Coast Railway companies," said local historian Ralph Cousins. "The rivalry got so bad between the two companies it led to the famous Battle of Havant in December 1858. Actually it was more a confrontation over who owned this new line and whether the other company had permission to go on it. These sort of disputes were usual in the early days of the railways." The campaign to prevent Farncombe's only bank from being closed failed, with local residents and retailers protests falling on deaf ears. The branch of the state-owned Lloyds TSB closed in December 2010. "My shop is now more isolated than ever as a result of Lloyds TSB's exit," said local butcher Mark Holt who led the campaign. "I bank with Lloyds TSB and it has been good to me over the years, but it has really let down the people of Farncombe by shutting up shop." The congregation at St John’s Parish Church in Farncombe were bemused to see two parishioners (May 2009) rush forward at the end of a service to remove one of the organ pipes and hastily carry it outside. It transpired that they had spotted a small bird poking its head out of the hole in the pipe when the organ was being played and sought to rescue what presumably was a rather deafened and disorientated creature from its ordeal. Reportedly the young swift quickly recovered and made off to quieter pastures. The rehearsal of a production of the Greek Euripides' play Medea in a church hall prior to the Edinburgh Fringe 2011 opened up a maelstrom of criticism. A Farncombe vicar however seemed to be a bit more openminded about the pagan play. According to Country Life Magazine villages to the south of Guildford are increasing in their appeal for commuters who are tired of having to fight for seats on trains. Farncombe and Milford were cited as being top choices as the extra stops meant that competition for seats was significantly less, and car parking was cheaper too. Shoppers at the Farncombe Co-op in St John's Street were encouraged (March 2012) to carry large bottles of water to draw awareness to the difficulties being experienced by women in developing countries. The Walk in Her Shoes stunt organised by Care International included using a traditional African yoke which women use to carry heavy loads of water for long journeys. Two musicians from a band called Hong Kong 74 paddled 100 miles down the Thames and into the Wey Navigations by kayak to raise over £1,000 for charity. Daniel Card and David Newman raised the money by busking. The duo, who completed their journey when they reached Godalming (August 2009), have donated the money to the Phyllis Tuckwell Hospice in Farnham. 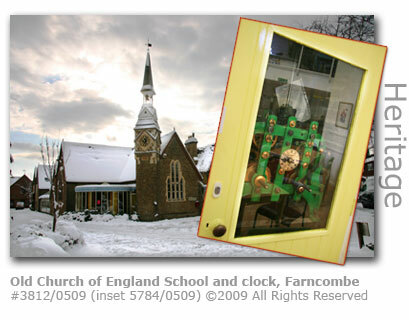 Farncombe suffered a similar fate to the rest of the country when the unsportingly extreme winter weather struck with a vengeance (December 2009 - January 2010). Some intrepid amateur filmmakers ventured out to catch the moment. Broadwater School in Farncombe was praised (March 2012) by the Education Minister for being amongst the 100 top performing schools in the country. The accolade was based on sustained improvement from 2008 to 2011. The popular village butchers in Farncombe, CH Wakeling, was narrowly beaten by Andrew Charles Meatmaster in Godalming Food Festival's 2010 'Sausage-Off' competition. As part of the local council's attempt to save £20,000 the public toilets in Farncombe and Bramley are under threat of closure (December 2010). Waverley Borough Council's 'portfolio holder' for the environment said that they need to 'think out of the box' and suggested that local retailers should allow members of the public use their toilet facilities to enable money to be saved by closing the public facilities. 'UFOs spotted by campers at Farncombe, Surrey on 21st July 2007' reads the caption for this YouTube video. Mmmm. The organisers of the inaugral Farncombe Fake Festival had to cancel the event (July 2010) after a combination of poor ticket sales and objections from local residents. The 11-hour music festival was to feature tribute bands. The Surrey Police helicopter was scrambled 80 times in a month (June 2010) searching for suspects in Farncombe, together with other outings to help fight the Frensham Comon fire and to search for a missing person in Guildford. Prior to the National Trust taking over Godalming Wharf (GR: SU974441) the site, after the Navigation closed for commercial business, went through considerable morphing of uses, which at various stages included a gas works (located where the police station now stands on stilts) and a bus station. The original 18th century wharf was built on a 10 acre plot of land acquired by the Navigation Commissioners when the waterway was completed here in 1764, and riverside it stretched up to Town Bridge. The difficulty of having the towpath running on the opposite side to the wharf was initially overcome by the building of a swing horse bridge, although this quickly fell into disrepair and the towpath was extended up to the road bridge very much as you see it today. By 1849 the dock had been filled in. In the 1980s the National Trust and Waverley Borough Council agreed a plan for the site which involved much of it being sold off to raise £2m in funds for the Trust, but also provided the council with an opportunity to impose some strict controls on the waterfront development. Today all that remains of the original Godalming Terminus is the wharf moorings and an original brick and weather-boarded building now used as a stable by the Godalming Packet Boat Company for a rest facility for its tow horses. The moorings are used for their boat, the Iona, and other privately owned vessels. Given the historic importance of this location as the upstream limit of the Wey Navigations it is a pity that more couldn’t have been made of the site, perhaps even with a small education facility. In its heyday in the early 19th century traffic to and from the busy wharf here carried timber planks, hoops for barrels, bark, flour and manufactured iron. The main site of the wharf was converted for retail use in the 1990s and today a large supermarket and several smaller stores occupy the site. Across the shallow valley beyond the Lammas Lands lies the sprawling settlement of Farncombe, a broadly modern development interspersed with small pockets of more historic buildings. Farncombe Station (GR: SU976451) was opened on the very same day in 1897 that the Godalming Navigation closed its terminus, very poignant timing given that it was effectively the railways that drove the waterway out of business. The Lammas Lands (GR: SU978445) are so called because this large acreage of open water meadow was part of the communal farming system which opened up the fields to common grazing once the hay had been harvested after the religious festival of Lammas on the 1st August. The name originates from ‘Loaf Mass’ when a loaf baked for the occasion was consecrated at a special mass to celebrate the harvest. The water meadows are designated as a Site of Nature Conservation Interest in recognition of the need to preserve an important habitat for rare and protected species including birds such as reed bunting (Emberiza schoeniclus) and plants including meadow saxifrage (Saxifrage granulata). Many species of insects are also attracted to the meadows. Waverley Borough Council took back direct control of the Lammas Lands in 2007 with the intention of providing close management to improve their biodiversity and public access, The council owns the meadows and had for some years leased them back to the family of the original owners, who in turn had rented the land to local livestock owners for grazing. Over this time horses and ponies have been a common sight on the water meadows. The council say that they were forced to take action after complaints concerning escaped ponies damaging adjoining allotments and other property including Broadwater Park, and intend to return to traditional grazing by cattle which they say will be tightly managed to prevent overgrazing. The Environment Agency undertakes dredging of the River Wey each year to maintain the navigation and also to prevent flooding. The agency operates from a site adjacent to Catteshall Mill but since a new doctor's surgery and chemist opened in the buildings alongside the additional traffic generated has made operations there more difficult. 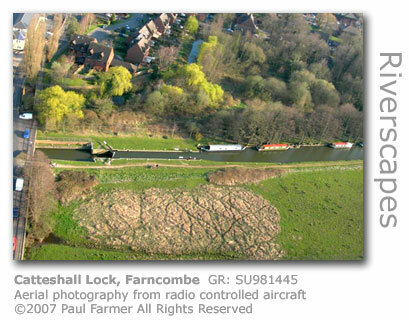 The agency therefore applied (February 2009) to lay a 650 ft (200 m) aluminium track across the Lammas Lands opposite Farncombe boathouse over which vehicles could manoeuvre and stockpile the dredged waste. The hinged metal track was to run parallel to the river from Catteshall Road to enable 20-tonne lorries access to remove an estimated 750 tonnes of dredging. Whilst the dredging was in progress during the spring the plan was to divert the towpath and fence off the stockpile, with the waste being removed once dredging was completed and the land and towpath restored with the aluminium track removed. However, Waverley Borough planners rejected the application saying that the agency's operation should still continue from the existing dredging facility at Catteshall Mill. The Navigation now part-follows the original course of the river, and part a man-made cut dug to cut through a lazy long meander that circles up through Catteshall. A local residents' association is expressing concern (August 2006) that Defra (Department for Environment, Food and Rural Affairs) is proposing to make cuts to the budgets assigned for flood defence. 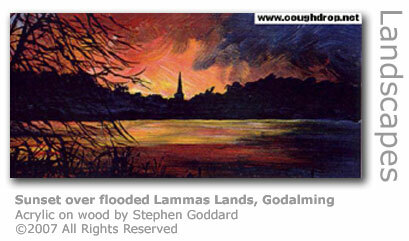 The Lammas Resident's Association, representing people who live under constant threat of flooding from the Lammas water meadows, has long been campaigning for improved flood defences and are worried over the fact that the National Flood Forum have made formal representations to the Environment Minister challenging Defra's position. "The Flood Forum have not quantified these cuts but they are rumoured to be substantial. This goes against previous Government promises and seems inappropriate with evidence that global warming is almost certainly going to increase the misery experienced by those who regularly flood," said the Association's chairman Bob Zannetti. "I am particularly concerned for the folk who live in the Catteshall area near Hell's Ditch." The water management system around Catteshall Lock (GR: SU981445) - rise of 5ft 6in (1.68m) - is quite complex in that it consists of three channels. Before the canal was cut, the river undertook several small meanders to Catteshall and the waterway sliced through these to straighten the route, with the lock built at the end of the cut. The course of the river proper passes through what is now an upmarket housing estate and rejoins the river at the end of an island, with an additional by-pass stream tumbling over a weir before reaching Catteshall Mill. The original lock of 1764 was rebuilt in the late 1990s using brick and Portland Stone in place of the original locally quarried Bargate Stone, which sadly couldn’t be sourced by the National Trust in the right sizes. 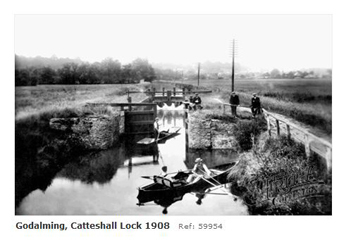 Three of the four Godalming Navigation locks were originally built of bricks, the exception being St Catherine’s further downstream which was constructed of timber. 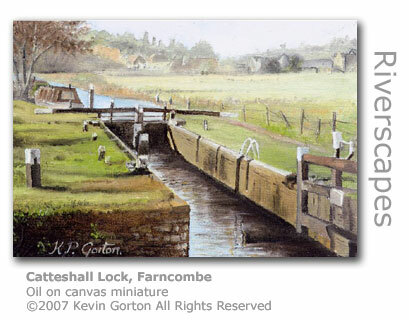 The Lock is 19 miles (31 km) from the Thames. 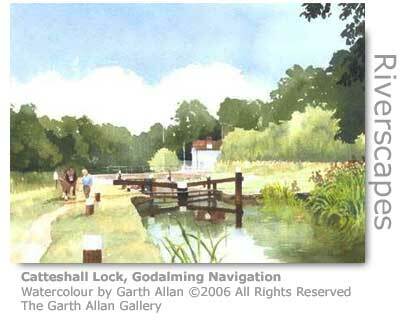 The nearest pub to Catteshall Lock is the Leathern Bottle a short walk away and located in Meadrow on the main A3100 running between Guildford and Godalming. On weekends The Three Lions (known locally as 'Scratchers'), a few hundred yards further down Meadrow towards Godalming, hosts live music with special focus on blues. 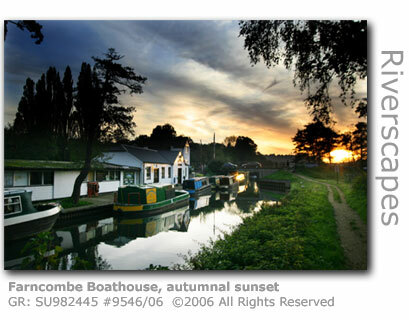 Immediately downstream from the lock is a modern bridge and Farncombe Boat House (GR: SU982445) appropriately surrounded by water on the spur of land that separates the Navigation from a cut that once serviced the mill. It is the bridge here, not the one right by the lock, that is Catteshall Bridge, built on the piers of a medieval bridge over the original millstream of the mill. The existing boat house was built in 1908 and is on land now leased from the National Trust, and the business today provides pleasure boats for hire to the public. 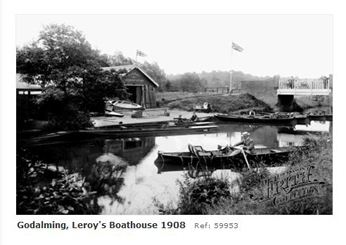 It is comforting to see that the tradition of pleasure boating continues to be successfully promoted by the boat house here, as it was on this site that one of the Leroy brothers, from a boathouse downstream in Guildford, set up business in 1895 taking advantage of the pastime the Victorians had taken to heart with a real gusto. The first record of pleasure boating was at Pyrford near Woking with an account in 1750 of a skiff being hired out for 2s 6d. There were originally nine boathouses hiring out pleasure craft but today on the Wey there are now sadly only those at Byfleet, Guildford and Godalming. A hundred yards or so further along Catteshall Lane from the boathouse is Catteshall Mill (GR: SU982445), once an extremely prosperous mill and one that has provided a lot of excitement for industrial archaeologists. A water turbine installed at the mill towards the end of its working life was found to be an 1869 Fourneyron. This French designed Belfast-built machine was the largest Fourneyron ever made and the oldest to survive. Having been rescued from irreversible decay the turbine was moved in 1981 to a temporary home at Westbrook Mill from whence it was hoped that it might be returned fully restored to its original home. 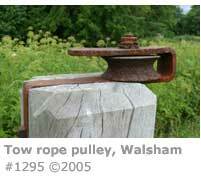 Sadly this was not to be and the turbine is now on show at the Ironbridge Museum in Shropshire. The site was listed in the Domesday Book as one of three in the Godalming area and over many centuries mills here have been involved in the fulling of woollen cloth, the grinding of corn, and the manufacture of both paper and leather. At the time of installing the Fourneyron the mill was producing paper. The site lay semi-derelict for decades but has now been renovated with all of the outlying industrial buildings that had spread around the mill having been given a new lease of life. These remain in light-industrial use but the imposing mill building which had housed the huge water turbine has been converted (2006) into upmarket apartments. The largest apartment, which has the commanding position at the top of the three storey brick building and includes a roof garden, is on the market for a hefty £550,000 (July 2006). The mill development, now renamed Penstock Mews to reflect the penstock to its front, is described thus by a local estate agent. "Penstock Mews at Catteshall Mill is a stylish development of new homes, artfully blending past and present. Believed to be one of the three mills recorded in the Doomsday (sic) Book, Catteshall Mill has for centuries presided over the riverside area to the east of Godalming. Today the original mill building, once renowned for its paper-making, has been carefully restored and converted into four unique apartments." The village of Farncombe, which was first documented as a manor in the Domesday Survey, was eventually absorbed by the urbanisation that rapidly occured after the coming of the railways. The village was recorded as 'Fernecome' in the 1086 document, describing its location as being a combe or valley where the ferns grew. Historians suggest that the reference to ferns was probably made more in deference to the fact that the ubiquitous plants, which grew commonly throughout the country, were used for medicinal purposes as well as for thatching and animal feed, and that it was likely that there was significant industry here in fern production. 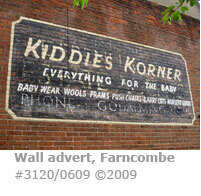 The placename of Farncombe was also adopted as a surname with numerous examples now spread across the globe. The Internet Surname Database record the earliest use of the name to be that of Robert de Ferncumb in the 1296 Subsidy Tax Rolls, who was living in Sussex at the time. 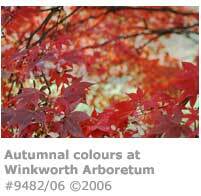 A flower has been named after Farncombe. The hardy geranium Farncombe Cerise Star, described as a 'flowering herbarium specimen', is registered in the RHS Horticultural Database and grows as a perennial. Once part of the Manor of Godalming, Farncombe was bestowed with manorial rights of its own by the reign of King Edward the Confessor (1033 – 1066). Around 1042 mention in relation to Farncombe Manor is made of a Saxon named Ansgot who was liable for rates on land tax for 350 acres. The manor house is thought to have been along a short track leading off Hare Lane in what is now Lower Manor Road. After the Norman invasion of 1066 huge swathes of England were claimed by William Conqueror and a great many estates fell into the hands of new landlords. This included Farncombe which was bestowed upon Odo, Bishop of Bayeux who was the king’s half-brother and who was recorded in the Domesday Survey (1086) of holding the manors at Farncombe and Bramley. 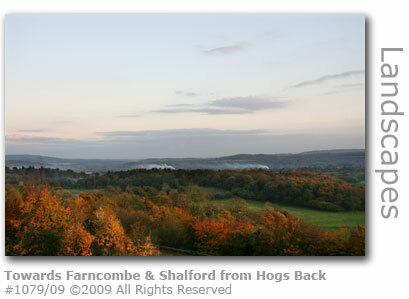 By this date Farncombe was registered as being of 200 acres. The manor was confiscated by the king when Bishop Odo was charged with treason and exiled to Italy and under a new lord was let out to tenants. A great many changes of hands follow over the centuries. The Mellersh family retained the manor in the 16th and 17th centuries, and it was one Philip Mellersh who as High Constable of the northern half-hundred (1) of Godalming found himself embroiled in the conflicting loyalties between king and country during the Civil War instigated by Oliver Cromwell and the Parliamentarians. Despite being thought of as having royalist sympathies he survived the turmoil, although as High Constable he was obliged to arrange food and lodgings for Parliamentarian troops stationed in the area. To add insult to injury he was also made to levy local taxes to raise money for Parliamentarian causes. Mellersh’s accounts of 11th may 1644 record that ‘the places full of soldiers’ in addition to Farncombe were Binscombe, Compton, Eashing, Hurtmore, Peperharow, Puttenham and Shackleford. When the Tithe Map of Farncombe was drawn up by the Church Commissioners in 1844 the Manor of Farncombe was held by William Sanders Robinson and Mary Dill Lane who placed the entire estate up for auction at Garraways Coffee House in Cornhill, London eight years later. This auction by the National freehold Land Society resulted in the manor being divided into 12 lots. Lot 6 was the manor house which was recorded as being ‘principally brick built, containing several sleeping compartments, living rooms and offices’. The lot also included a bailiff’s cottage, ‘a good pond’ and was surrounded by a plot of land. The bailiff’s house stood opposite where the Freeholdrs public house is today. George Marshall of Broadwater had also added some land into the auction which resulted eventually into a total of 186 lots being released for independent development. 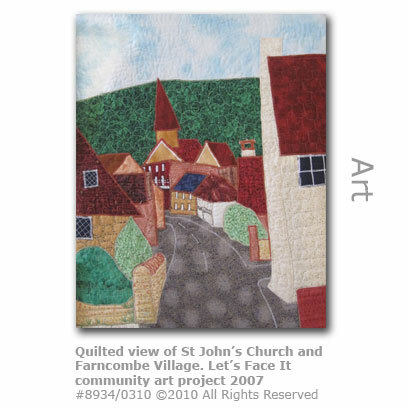 This was in effect the start of Farncombe being transformed from a sleepy hamlet into the sprawling extended village it is today. The manor house and bailiff’s cottage were demolished in the early 1850s leaving very little evidence of their existence. 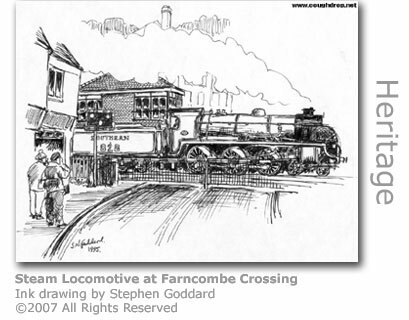 The railway line through Farncombe was built during the Victorian's head of steam era. The stop, which was opened in 1897, was originally a minor one with local lore suggesting that a director of the railway at the time, Sir Frederick Marshall, had a house at nearby Broadwater and insisted on being able to use the service. A more sensible reason would be the fact that the original Godalming Station, then sited closer to Farncombe than it was the town of Godalming, was planned for closure the following year when the station was relocated close to the main town centre as the railway network was extended. Old Godalming Station continued as a goods depot until it was closed in 1969. 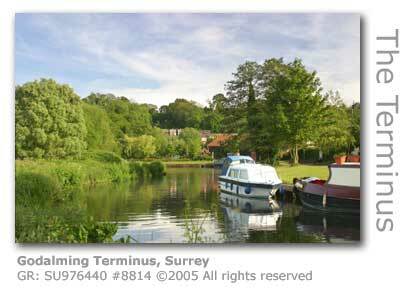 Poignantly, Godalming Terminus, which served the freight barges that used the Wey and Godalming Navigations closed the same year as Farncombe Station was opened. A decision by South West Trains to slash ticket office opening times at Farncombe Station in a bid to save money went ahead (September 2010) after Department for Transport approval. No staff will be on duty past lunchtime on weekdays and from early afternoon at weekends, with tickets available from a ticket machine. Independent rail watchdog Passenger Focus had fought the changes. 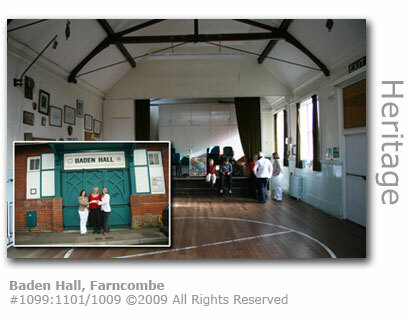 The Farncombe Day Centre located next to the church is housed in the old Farncombe Church of England School which was founded in 1858. Although the original building has been considerably extended to provide for a drop-in centre and accommodation for the elderly much of its original features have been retained. These include the clock tower which was installed in 1884 when an early extension to the building was made. The clock, which was manufactured by John Moore of Clerkenwell, London, is a handwound striking turret clock. The clock was restored by Freddie Hill CMBHI of Godalming in 1988, and in 2001 Waverley Borough Council who own the building arranged for Croydon clockmakers to reposition the clock movement at ground level to enable easy maintenance. The movement is accessed through a door in the old school hall at the base of the tower. The village lost its social club after 95 years. The Progressive Club in St John's Street had become a social problem in the eyes of many and had its licence revoked after the police raided the venue and discovered evidence of drug dealing on the premises. Twenty three people were subsequently convicted for the supply of Class A drugs. In the last few years of its existence the private-members club had turned from a friendly and safe community hub into what locals described as the 'aggressive club' with a long list of recorded incidents since June 2005 of assaults, public disorder, noise and drugs offences. Planning permission was sought (April 2008) for demolition of the building and for a three-storey block with six flats and a 'community unit' to be built facing the road with a second block of three houses behind. This was rejected as 'over-development'. The plan for Domino Pizzas to take up a retail unit in a new application was rejected (May 2009) as the council felt there was no need for additional fast food outlets in the village. The alternative application of 11 two-bedroom terraced houses has been approved, subject to a possible appeal from Domino Pizzas. The building was demolished in December 2009 and is currently under development with a completion schedule for the summer of 2010. 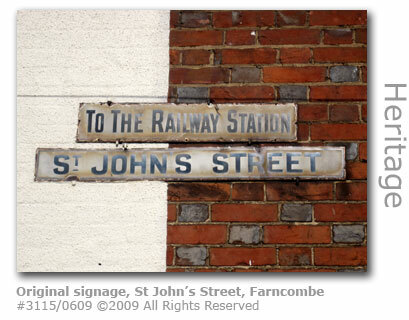 Familiar to visitors of Farncombe is Station Garage located in Farncombe Street. Farncombe House, once a private residence, is thought to date back to the 18th century and is listed as a building of Local and Historic Interest. The Tithe Map of Farncombe 1844 divided the property into two plots, a 'yard and stable' and a 'house and garden', although the property lost part of its land to the railway when it was built through here in 1849. In 1859 Farncombe House was a preparatory school for boys, and which by 1869 taught children between the ages of 4 to 13 some of whom came from other parts of the country and from abroad. By the mid-1870s the school had been converted to provide education for girls only and was documented as' Mrs Fisher's Educational Establishment for Young Ladies'. The school at that time had grounds that extended from the house and stables to the boundary near the railway crossing where Hillyers Bakery now trades. The death of Mrs Fisher resulted in the closure of the school in 1908. Margaret Fisher is buried in the old cemetery in Nightingale Road. At this point the property reverted to a private house and was occupied by a local doctor, Dr. Boyd, who lived there until 1918 when the property was converted into a garage including petrol pumps installed to the front by the road. By 1950 Station Garage had been taken over by the Bonner family and who still own the business today. Much of the garden had been sold off in 1931 to a Mr. Rossie who built the block of four shops that stand today to the left of the property. In 1918 Surrey Police records show that the Force employed its first policewoman who was posted to Farncombe to deal with prostitutes who had moved into the area attracted by the wartime army camp at nearby Witley. The dawn of scouting under Lord Baden-Powell, who was educated at nearby Charterhouse School, saw the first scout troop formed in Farncombe in 1912 where meetings were originally held in Farncombe Street Hall run by Farncombe Church before a drill hall was built in Station Road. More about Baden Hall HERE. People who know the area will be familiar with the steeply inclined Farncombe Hill that connects Farncombe with Charterhouse School. Both the course of the road and the profile of properties that line it have changed considerably since the 1970s. Farncombe Hill, then known as Hurtmore Road, was dominated by a large imposing house built of local Bargate stone in the 1860s that looked out over the village from its high vantage point approximately where Hillside Close joins Twycross Road today. Hillside House was set in substantial grounds, which were built over in the 1970s when the house was demolished to make way for two new housing developments. Local historian John Young has traced the history of the house back to an advertisement that appeared in the Surrey Advertiser in May 1867. It advertised the fact that ‘hydropathic’ treatment was being provided by one Mr Maberly M.R.C.S to provide ‘cure or relief of disorders of the chest, nerves, digestive organs, rheumatic and gouty complaints, and general debility.’ The property was being used as a residential treatment centre, although by the time of the 1871 census Mr Maberly was no longer registered there. By 1881 the building had been turned over to a boarding school for boys trading simply as ‘Hillside’, with the school being run by headmaster Arthur Curtis, his wife, a 23-year-old assistant schoolmaster and nine domestic servants including a cook, matron and nurse. Thirty-six pupils boarded there, with home addresses scattered across the UK and from as far away as Quebec and St Petersburg in Russia. By 1940 the school had closed and the property was registered as the Hillside Guest House, although four years later ownership had been transferred to the London Co-operative Society from whence it appears to have remained as a private house. 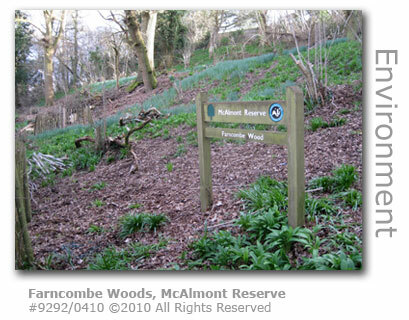 Managing woodland as coppice is important for wildlife. Coppicing may look drastic but is essential for much of our best-loved woodland wildlife which may be threatened with extinction if this is not continued. In this traditional management system, trees are regularly cut to the ground and regrow with several stems, providing the wood needed for a wide range of products. Time between cuts varies depending on the intended use of the wood that needs to be regular so that there are always some open areas. Here warmth and light can reach the ground. This encourages plant growth and insect activity - but this effect decreases yearly as trees regrow until branches meet overhead, and light can no longer reach the woodland floor. So coppice cycles, with some cut each year, must be maintained to ensure continuity of open space. Help wildlife by supporting the coppice industry. Buy local logs, charcoal and other wood products. 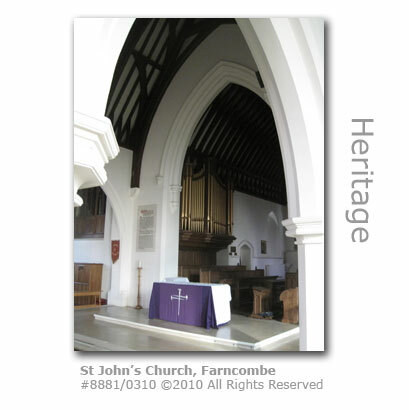 St John’s Church in Farncombe was built in 1849 in what was then Upper Church Road. The rectory is located at 38 Farncombe Hill. The Church of St John, Apostle and Evangelist, Farncombe - to give it its full name - is a relatively modern church having been consecrated on July 19th 1849. The idea for a new church for Farncombe was proposed by the vicar of Godalming, the Rev JG Bull, in 1838 in response to the rapidly increasing population that the coming of the railway stimulated in the early 19th century. 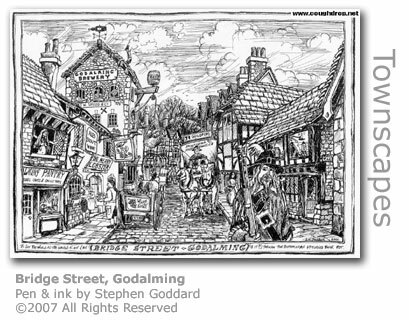 In 1841 a census of Godalming parish was taken showing that Godalming itself had 463 houses with 2,198 inhabitants. The hamlets of 'Ferncomb' had 173 houses with 804 inhabitants, 'Catshall' 27 houses with 132 inhabitants, and Binscombe 19 houses and 99 inhabitants. A total of over 1,000 people across the three hamlets. In 1843 a prospectus and plan was released for the building of a church "the size such as to admit of 365 sittings, the greater part of which to be free." The church, which was to be built in the 'early English style of Gothic architecture' was expected to cost around £1,600. In the event the total cost including a repair fund, the consecration and legal expenses eventually totalled £3,365.1s.7d. The building was financed after a series of appeals were made resulting in donations from all over the country and abroad. Notable donators were the Queen Dowager (Queen Adelaide, wife of William IV), the Duchess of Gloucester, the Duchess of Beaufort, and the Rev J Mason Neale - a well-known hymn writer of the time. An earlier plan for the building of a church had identified a site on land owned by a parishioner in Hare Lane, but the church was to be eventually built on land donated by James More-Molyneux of Loseley. Interestingly the plot had legally "lapsed to him as Lord of the Manor because it had previously been owned by a man convicted of murder". More-Molyneux took pity however on the man's widow and provided an annual rental for the land which was "commuted for the sum of £15". The architect commissioned for the job was Sir Gilbert Scott (1811 - 1878), who designed many famous churches - and whose son Sir Giles designed Charterhouse Chapel. The builders were James Moon and son, who provided an item on the builders account: "Paid the men not to work on a Good Friday ordered by Mr. Boyce, Mason 1 day, Bricklayer and Labourer 1 day, 10s. 10d." James More-Molyneux as Lord of the Manor, resided over the 'laying of the first stone of church' in May 1846. The build itself proceeded apace but the consecration had been legally delayed until all expenses had been met, which resulted in a dilemma when fund-raising ground to a halt with a shortfall of £234 on the build and no money for the necessary £1,000 endowment and a repair fund. At the 12th hour in June 1849 the shortfall was given by guarantee and a month later "Mr. Lyon, Curate of West Tisted" attended the consecration as the new curate. Eleven years later the north aisle was added with "sittings for 220 people" at a cost of £1,250, and the south aisle was added in 1874 at a cost of £2,075. The bell was purchased in 1849 for £28.6s.0d. 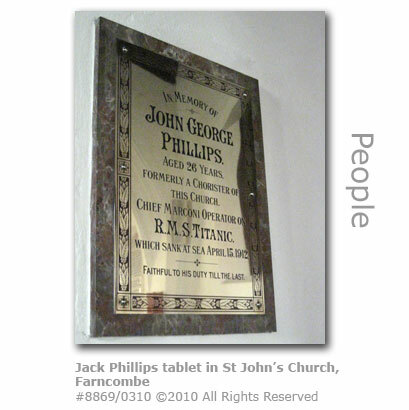 In memory of John George Phillips aged 26 years. Formerly a chorister of this church. Chief Marconi Operator on RMS Titanic which sank at sea April 15, 1912. Faithful to his duty till the last. The Memorial Chapel was described by one Charles Allingham in 1924 as "the beautiful chapel in the South Transept, erected as a memorial to the men of the parish who fell in the war of 1914-18. Their names are inscribed on the oak panelling. The design of the screens and panelling is based on the 15th century screen of North Bovey Church in Devonshire". Official records show the fact that the firm that were contracted to build the chapel and the pulpit "employed a number of disabled soldiers". Midst meadow, hill and ploughland, beside the river Wey. To placate local businesses one of the days in the week long celebrations was dedicated as Tradesmen's Day in which there were no planned events, and which were perhaps thought likely to negatively impact on their trade, and for which this slogan was proposed: "No show today? No! Shop today!" All the fundraising in this Centenary Year enabled a Chapel of the Resurrection to be erected in the North Aisle as a memorial to those who fell in the Second World War. In the early 1950s this chapel took on the name of the Memorial Chapel, with the original 1924 Memorial Chapel being renamed as the Lady Chapel. In the early years, and as with any new building, there were teething problems and St John's was no exception. An architect's report in 1894 stated that the church had been reported as being both stuffy and draughty at the same time and that there were sometimes "violent cross currents of air" and " When empty there is no draught even with the doors open, but the equilibrium is disturbed even under such circumstances, as soon as the building is occupied by a congregation ... then an open door is a serious matter and a cause of excessive discomfort to all in the vicinity". The architect diplomatically stated that "much allowance must be made for individual constitutions", and provided very detailed advice as to the lighting and damping down of the fires, and recommended installation of dormer clerestory windows (1). Sadly for the congregation the latter were never provided and so presumably their discomfort continued. Fundraising for the everyday costs of running the church relied on some very interesting avenues - which included the fact that the main income in 1849 was from pew rents. Voluntary subscription and collections provided for much of the rest. In 1858 a school for older boys and girls was built next to the church with an infants department added in 1863. Classroom and a turret with a clock were built in 1884 at the cost of £386.9s.11d. The school church movement was extremely proactive in Victorian times and quickly moved to accommodate a rapidly growing local population. In 1905 a new building was constructed in George Road (1) (2), and which today is occupied by the Farncombe Church of England Infant School, although the original buildings have since been extended. Community activities at the church extended to the running of a great many clubs which included a youth club with its own premises in Fern Road. A church hall was built in the same year in Tottenham Road and today as Baden Hall operates as an activity centre for the local guides and scouts - MORE HERE. (1) Godalming Museum corrected this date (originally incorrectly stated here as 1892) on authority of research by local historian Peter Stock. Farncombe Boys School (or officially Farncombe School (Boys)) was first listed in the local street directory 1906 edition. The school, as an extension of the Church School (Farncombe National School) by St Johns Church, accommodated the boys, with the girls remaining in the building by the church. A full and interesting account can be found in Stock's 'Bygone Schools of Godalming & Farncombe'. (2) At the turn of the 20th century Farncombe's George Street was renamed George Road in order to eliminate any confusion with George Street off Godalming High Street. To compound the confusion the road was divided into two by the Guildford / Godalming administrative boundary, with the Guildford end beyond the sharp bend known as George Road and the Godalming stretch George Street. The name change was applied when Godalming Borough expanded. Many thanks to local historian John Young for correcting this entry. Interred to the right of the church door are the remains of Charles Robert King Dallas, rector of the parish from 1859 until 1878. Dallas had previously fought as a soldier in Wellington’s army leading to the Battle of Waterloo. On either side of the altar in front of the choir stalls entrance are paintings depicting the Ten Commandments painted by one Benjamin Caesar junior. The Caesars were a large and well-known local family that included the cricketer Julius who played 194 first-class matches in his 18 career. A ‘quiet garden’ has been created in the church grounds and is listed by the BBC in their database of Breathing Places’ (2). The project was made possible with support from local residents and volunteers and funding bodies including Living Spaces, Breathing Places, the local and county councils, Loseley Christian Trust (3) and the ER Thomas Trust. A new Church Room was built as an annexe and dedicated in August 1989. Five years earlier the school next door had been put up for sale (MORE HERE) and the old sawmill was closed down and replaced with sheltered housing in 1989 and dedicated as Allingham Court in memory of Canon Allingham. In the late 1850s church records illustrated well the harshness of life at the time as the majority of burials were of infants. As an example in 1857 there were 16 burials in the churchyard, and of these 11 were infants. The church also had to contend with the threat of fire from a sawmill which had been sited next door, as records of an emergency meeting in 1958 record. There had been a fierce fire in the woodyard of A.S. Lines and local parishioners had rushed to the church in case there was a need to remove valuables, although this proved to not be necessary at the time as there was no damage to the church fabric. There was however concern expressed that the intense heat might have affected the organ which was then valued at £25,000. A letter compiled during the meeting pointed out to the local council that the saw mill property was only seven feet (2.1m) away and that large quantities of highly inflammable material were stacked against the boundary fence. Demand was made to ensure that "the firm's practice of lighting bonfires must be absolutely prohibited and a night watchman should be employed". The fire at the sawmills dubbed locally as the 'lollipop stick factory' and where high-class mouldings for the furniture industry were made, was one of a number of unexplained fires that occurred on the site. Six weeks later the Surrey Advertiser reported another fire at the sawmills because of which was suspected at the time as arson. A.S. Lines closed down in the mid-1980s the sawmills been replaced by the complex of retirement flats that stands on the site today. The buildings were named as Allingham Court in memory of the Rev Charles Allingham a popular Farncombe clergyman. In the 1960s fascinating snippets of information were detailed in official meeting records including a request at the annual meeting in 1967 that "the choirboys be encouraged to sing more enthusiastically", and concern over the damage being caused to the church floor by "ladies stiletto heels and winklepickers" were noted in 1961 against the comments from the rector saying that "a change in the fashion was due - but in any case he was powerless in the matter!" 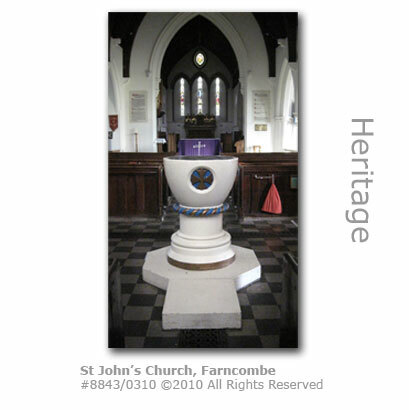 "St John's, Farncombe was built as a mission station, an outpost of the Christian Church, just 121 years ago. Everything about it says' Victorian', which is just as it should be. But it becomes increasingly difficult to use it just as it is, in a totally new society. When St John's was built, everyone had a place, the squire in the chief seat, the clergy high and lifted up, the choir on display for all to see." Vandalism and theft, although it never got out of hand, has been an occasional feature at the church. The contents of the 'free-will' offering box had been stolen in 1918 and on various later occasions. In 1985 the Midnight Mass was rescheduled to an earlier time to "avoid the problem of late revellers" and an instance of youngsters who had been found "smoking on the porch" was recorded in 1986. The priest's chair was stolen on Easter Day 1990. A replacement chair, dedicated to the memory of a local resident who had recently died, was about to be installed when the original was found in a flower bed by the church door early one morning in 1991, returned in guilt perhaps. The insurance company allowed the church to keep them both. Vandals broke into the church in 1995 and having done serious damage to three doors, the organ and a stained glass window stole brass candlesticks and an angel figure. "Although throughout the greater part of its history Farncombe has been overshadowed by, and to a great extent dependent upon, the neighbouring town that eventually absorbed it, it would be entirely wrong to suggest that Farncombe was a mere appanage, a sort of industrial suburb of Godalming. It most emphatically has an individual character of its own; it is a real community with a very lively consciousness and pride in its own identity. For the last hundred years the focal element in the committee spirit has been the parish church. Long may Farncombe and its church continue to flourish together!" (1) Clerestory windows or 'lights' are windows above eye level that allow light into a space. (2) The Breathing Places programme is a UK wide small grants programme developed in partnership with the BBC and was launched in 2005 to encourage people to care about their local environment. It complements the BBC’s Breathing Places campaign by giving funding for small groups. In phase One, Two and Three of the programme £8.5 million was distributed for projects that improved the local environment or created new breathing places. £1 million has been made available for the final phase which concludes during 2009. (3) The Loseley Christian Trust was founded under a trust deed funded by the More-Molyneux family in 1983 to promote Christian healing. 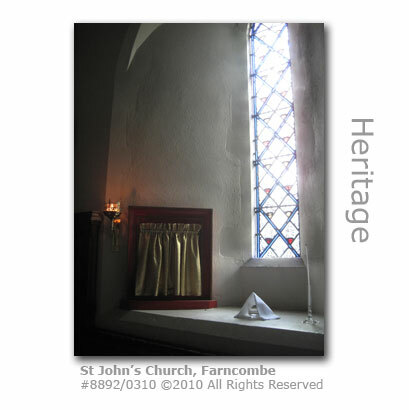 include 'Celebration 150 - The Story of Farncombe Church 1849 - 1999' by Barbara Hammond and Hazel Freestan March 1999. 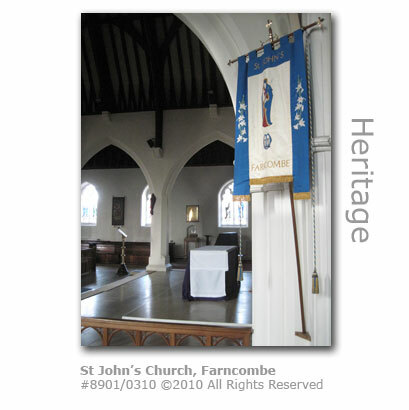 Copies of the book can be purchased in the church and provide fascinating illustrations and detail about St John's. 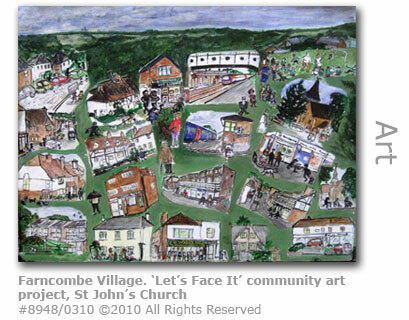 In 2007 a community art project was launched in Farncombe to bring together local residents with the aim of producing a 'snapshot' of life in the local community. The project, Let's Face It!, was co-ordinated by the Watts Gallery's artist in residence, Sandy Curry who worked with a wide variety of Farncombe people from the very young to the very old. Workshops were held on Saturday afternoons between May and December of that year in the Church Room at St John's. 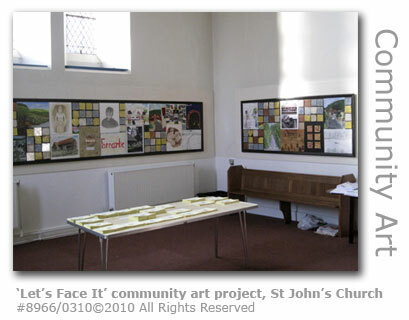 The results of the community's efforts are on display (2010) as a mosaic in the entrance hall of the Church and cover everything from sketches and paintings to photographs and ceramic tiles. "It's not so much a history of Farncombe or the story of one individual or group, as an expression of what it feels like to live here now, a snapshot of this moment, by people from different backgrounds who live close to one another, but don't often meet." The project was supported by the Bishop of Guildford's Foundation, Godalming town council, the ER Thomas Trust for the Blind and Elderly of Godalming, Surrey Police, St John's Church and Watts Gallery in Compton. 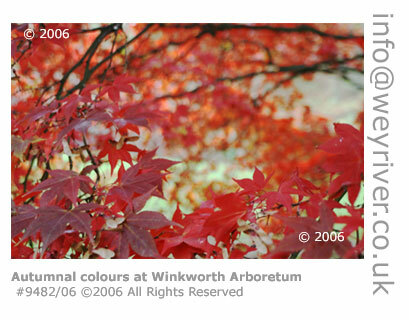 Images of some of the artworks are illustrated elsewhere in this section about Farncombe. The St John's church hall built in 1892 in Tottenham Road was taken over by the Scout and Guide Association in 1977 and renamed the Baden Hall. The building was showing signs of its 100 years later and the scouts and guides were struggling to keep it open through lack of funds. In order to renovate the building to a level that satisfies modern health and safety standards the management committee needed to raise £40,000. This initial phase would cover just bringing the building into a safe state. "At the moment it is just in a terrible state," said Sarah Kershaw treasurer of the committee. "There are cracks in the walls, the cupboards are falling off the wall in the kitchen and the toilets are disgusting. The whole lower hall needs gutting really. We need structural work, rewiring and a total renovation inside to make it somewhere people want to be. The next phase will be to work on the upper hall and put in a mezzanine floor." The major problem the committee had was that they were unable to attract any organisations to use the hall on a paying basis because of its condition, which meant they had no regular revenues in order to provide for essential maintenance. The situation had become so bad that the Rainbows and Brownies had stopped using the building after parents and leaders raised concerns (April 2010) about their welfare on the premises. And to add insult to injury a member of the committee was mugged (February 2010) whilst on her way to the bank and £780 was stolen, money that had been raised in fundraising events over the festive season. The culprit has never been arrested. By April 2010 the committee had secured grants worth £27,500 and was continuing to actively fundraise to try and make up the shortfall in funding. Godalming Town Council provided a top up of £2,000 (July 2010) to add to the £2,500 provided in the previous year. The funding went towards the renovations, which included gutting and replacing the kitchen and toilets, widening the doors and carrying out structural repairs. The committee also hoped to be able to refurbish the hall and install a mezzanine floor. Many public houses in Farncombe have come and gone over the centuries. The oldest pub according to local records appears to be the Three Lions on the corner of Meadrow and Hare Lane and dates back to at least 1723 at which time it traded as The World's End. The Three Lions today has been absorbed into the ribbon development which occurred after the Victorians introduced the railway in the 19th century but was once sitting in a distinct hamlet, remnants of what can still be seen with the older buildings opposite. An annual fair took place in a field on the other side of Hare Lane in the 19th century which is documented as being organised by the inn, and public hangings which took place on gallows erected on the Lammas Lands between Meadrow and the River Wey also guaranteed good takings for the day. The Observer newspaper noted after the public hanging of two murderers there in 1818 "that the landlord of the Three Lions, Mr. Mandeville, did an immense trade on the day of the execution, which has never been equalled." In the 21st century the Three Lions continues to maintain the tradition of providing a popular 'local' for Farncombe residents but has also for over 60 years provided a venue for live music. In this role the pub is fondly known as Scratchers and provides free music with live bands appearing every Saturday and Sunday throughout the year. There has been much debate as to how the name of Scratchers originated with popular stories ranging from an infestation of fleas that emigrated from a large removal warehouse next door (now a swanky block of flats) to the fact that the cellar of the pub was periodically used to lay the bodies of those unfortunate enough to be dealt with by the hangman in the Lammas Lands - and the scratching was the sound of the dead trying to climb out of the coffins. The real reason is a lot less dramatic. For many years the sign hanging outside the pub and long since replaced depicted three lions beneath a tree, with one of the lions on its haunches scratching at the bark. Another pub with a similarly long history, this in the centre of Farncombe, was the Rising Sun although this traded for much of its history as a 'beer house' (1). The oldest records found mentioning the business date back to 1769 when it operated from a timber-framed house which later was taken over by "Hillyer's Bakery". In 1910 three cottages next to the railway line by the crossing were demolished to make way for a new building to be occupied by the Rising Sun. This building was converted into flats (2008) after the pub finally closed down in 1987. (1) Beer house categorised drinking establishments that operated without a full licence to serve alcohol (such as a public house) and which were formalised when the Beer Act of 1830 was introduced to control out of control public drinking stimulated with the rapid evolution of illegal gin houses in the early 19th century. A beer house as the name implies could serve only beer but allowed the licence holder to brew their own and could operate from a private house. The White Hart pub in Bourne Road has an original stained-glass window advertising the Hodgsons’ Kingston Brewery Company. The window made the local news as pub art historians had painstakingly tracked the window art down in order to help the Compasses pub in Egham Hythe renovate the stone arms above their door in time for the pub’s 100th birthday celebrations. Repainting over the years had resulted in the original colours becoming lost and so photographs of the Farncombe pub’s window provided exactly the reference the painter needed. The Hodgsons’ Brewery, which owned a number of pubs across the county, closed in 1942. The Railway Hotel at the end of Meadrow closest to Godalming was built in 1849 to serve passengers arriving at what was then London and the South Western Railway terminus, located where old Station Way now is. When the railway line was extended to Havant in Hampshire a decade later a new station was erected in Godalming and the building became more of a public house than a hotel. Next door a smaller and older pub called The Fountain had been converted from a boarding house into a pub around 1832. A fire at the Railway Hotel in 1933 led to Hodgson's Kingston Brewery, which owned both premises, demolishing them and replacing them with the building that stands here today. The Railway Hotel changed its name to the Wey Inn when the old station finally closed in 1969. The large hall at the back of the pub has provided many different facilities over the years ranging from a snooker room to a skittle alley and currently (2010) serves as a cafe run by the pub. Meadrow, being the main thoroughfare from Godalming to Guildford, was once well served with pubs and beer houses. The Tanners Arms, now a block of offices on the corner of Kings Road, was built in the mid 19th century and also provided for a coach house with stable, a bakehouse and a shop. It closed in 1951 at which time it was taken over by local builders Deeks and Steer. Today some of the original pub windows still remain. Close to the location of the Tanners Arms is the Leathern Bottle which was built around the same time and originally traded simply as a beer house until acquiring a full licence in the mid-1950s. The pub today is a popular watering hole for local residents. On the other side of the road opposite was the Half Moon which was built in the mid-1830s but suffered the same fate as many of the other drinking houses along Meadrow when it closed in 1985 to be converted into an office building. The Carpenters Arms, located closer to Hare Lane was built on a plot of land purchased by one George Kentfield for £60 in 1852 and survived until 1935 when it was converted into a baker's shop trading as The Old Wood Oven. Kentfield also built the Prince of Wales in St John's Street in the 1850s which traded as a beer house until it was demolished in 1959 to be replaced by flats. The Freeholders on the corner of Fern Road with St John's Street, and which thrives today, was built in 1851 by Thomas White and provides a good example of local Bargate stone. The property, once part of the Friary Brewery includes a large hall above and a garage that was converted from stabling for four horses both built in the early 1900s, although this extension had to be rebuilt in the early 1990s because of its dangerous condition. Musician Andy Moore saved the Freeholders from an uncertain fate when he took over the tenancy in the summer of 2010. The pub had been listed for sale by the Fullers brewery. Moore launched a new music venue in the refurbished hall above the pub in May 2010. The Farncombe Cavern is billed as providing regular live entertainment including comedy acts as well as blues, country, folk and jazz. As well as the music venue launch Moore and his partner Shelagh Burton have given the pub a face lift too. "It's a fantastic business and we're very much looking forward to 2012," said Andy Moore, two years on. "We're doing some work with local bands at the moment, and we have a lot of things lined up. We're hoping to be a live recording venue, and we have a couple of chaps helping us out who are taking media studies courses who are working on live podcasts. It should give us the ability to attract better artists, and our new licence will help because before we were only able to offer a few nights for performers, which weren't always convenient. Broadwater Park off Summers Road, Farncombe (GR: SU984454) provides an expansive leisure facility set in 73 acres (29 hectares) of parkland complete with a 10 acre (4 hectare) ornamental lake. The lake is managed by the Godalming Angling Society with fishing restricted to permit holders. On site are tennis courts, and cricket, football and rugby pitches. A new all-weather games facility was installed (May 2009) on old tennis courts after a campaign by local young people helped Waverley Borough Council raise funds. Contributors included the Safer Waverley Partnership, Godalming Town Council, the Youth capital Fund, South West Trains and the council’s own Capital Programme. Broadwater is also home to sports clubs and a leisure centre. Guildford Rugby Club, formed in 2002 by the merger of Guildford and Godalming RFC and the Old Guildfordians RFC, caters for competitive rugby at all levels from Minis rugby and youth, to ladies and veterans playing on five rugby pitches. The club operates out of a large club house complete with bar and shop. Farncombe cricket club, which was founded in 1938 and plays to league level, operates on a ten year lease of the cricket square from Waverley Borough Council and has constructed its own pavilion. Also at Broadwater is a privately managed 9 hole pay and play golf club and Godalming Leisure Centre, which has an indoor swimming pool, gym, sauna, group exercise studio with a sprung floor and squash courts. After years of deliberating Waverley Borough Council agreed (December 2008) to proceed with plans to provide a new leisure centre to replace the deteriorating 37-year-old facility. Council surveyors had deemed the existing structure to be inadequate to be able to provide a cost-effective refurbishment for the original £2.6m project, and the council has announced its intention to ‘ring fence’ the original budget and now to seek additional funding. However there is some dispute as to whether this initial funding is guaranteed as only £1m is from existing council reserves with the balance to be generated through third-party borrowing. In 2007 the Jethro Play Equipment Fund (1) was established to provide for new equipment at Broadwater Park. (1) Jethro Field was murdered in 2007 at his home in George Road, Farncombe at the age of six. The fund was established by his mother to commemorate the fact that her son loved playing at Broadwater. After many months of fundraising and consultation the site for the new sports and games area has been chosen (February 2009), with this to be sited adjacent to the grass tennis courts at Broadwater Park. The cost is estimated at £40,000. The Sports Use Games Area (SUGA) was officially opened (September 2009) by Cllr Carole Cockburn, deputy mayor of Waverley. On the north-eastern boundary of the park are the grounds of Broadwater School. The school and park reside on the grounds of the Broadwater House estate which was sold by the Marshall family in the late 1950s and the house demolished. The house stood where the school’s playing fields are sited. The school itself dates back to the 1870s when it operated as Meadrow School, with the current site originally operating as an extension to the Meadrow facility in 1959. The buildings were extended in 1966 to house the whole school and in 1970 was established as a mixed comprehensive school for around 600 11 to 16-year olds under its current name, small by Surrey standards. It operates as a ‘maths and computing specialist college’. The first prize in the schools competition for building and launching the largest and most powerful water rockets was won by a team from Broadwater School. Team Infinity and Beyond successfully competed (June 2011) against 50 teams from around the country, all bidding to build a rocket that would stay in the air longer and show accuracy in launch and landing. The Water Rocket Challenge was organised for charity by the National Physics Laboratory in Teddington. Entries included a 11ft (3.4m) rocket made from 100 drinks bottles which was thought to be the largest water rocket to have ever been successfully launched. The Guildford Hockey Club uses the school’s facilities as their base, which also include a floodlit all-weather pitch, netball, tennis and a gymnasium and sports hall. The Rugby Club at Broadwater Park has been given the green light to completely revamp its clubhouse which was originally constructed in 1954 and has deteriorated to such an extent that the club's treasurer confessed that: "the present buildings are in desperate need of updating, and are now in such a state that I would be embarrassed to take my mother," said Matthew Farrant. It would appear that public support for the club overcame an initial rejection of their plans as initially the borough planning officers recommended that the application be refused. Their concerns were the fact that the club is on greenbelt land, that its size and scale would 'detract from the appearance of the surrounding area' and that it was a leisure facility being built some distance from the town centre. Luckily the council's central planning committee decided to award the club (April 2010) permission to proceed. Straddling the boundary between Guildford and Godalming, Guildford Rugby Football Club was formed in 2002 when Guildford and Godalming RFC merged with the Old Guildfordians RFC. The plan is to demolish part of the existing buildings and replace these with a tea room and ladies changing facilities. The rest of the building will be completely renovated. 'Budenscumbe' was first documented in 1227 although local historians believe that there was crop cultivation here well before the Norman conquest in 1066. Artefacts from the Iron Age have been found in Binscombe, and close by near Charterhouse evidence of Romano British settlement is evident. The hamlet, referred to as 'Benscombe' in 1508, had always been set well apart from the bigger settlement of Farncombe only being merged by ribbon development in very recent times. In the English Civil War (1642 - 1649) Parliamentarian troops were billeted in Binscombe and Farncombe as well as other villages in the district. The High Constable for the Northern division of the Hundred of Godalming, who was made responsible for collecting taxes for the Parliamentarians and arranging their accommodation in the area, was also Lord of the Manor of Farncombe - one Phillip Mellhersh. He would authorise quotas for local householders which stated the number of soldiers to be billeted and the period of time they were to be quartered in their homes. 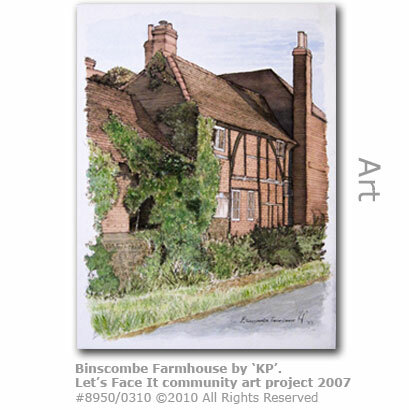 A number of properties in Binscombe date back to the 16th century and beyond. Binscombe Farmhouse has timbers dating back to the period as do Rosetree Cottage, which was built before 1550 as a three-bay open hall house, and St Christopher's Cottage which is early 16th century. All Grade II listed. Thomas Patching from Horsham inherited Binscombe Farm from his uncle in 1655, and having attended a Quaker meeting in Sussex that year addressed by the preacher George Fox was so taken by their philosophy that he invited Fox and other leading Quakers to his new home in Binscombe so that they could hold their meetings in one of his barns. This history explains the presence of a small burial ground in the hamlet in which 161 Quakers are buried. Quaker burials took place here from 1659 until 1790. The plot is right next to the location of the barn. Patching himself fell foul of the persecution that befell the Quakers at the time, and having been arrested and thrown into prison he fell ill and died. He is one of those buried in the burial ground. Turlough Bramber, who has been closely involved with the rebuilding of the Wey and Arun Canal (HERE) as the trust's restoration manager (appointed 2004), converted Fox's Barn for residential use as an 11 year refurbishment project. 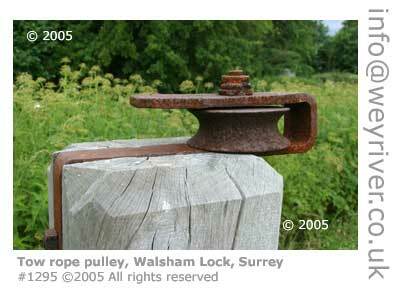 In 1997 the conversion was rewarded with a 'commended' Conservation Award by the Surrey Historic Buildings Trust. 161 Members of the Society of Friends (Quakers)were buried here between 1659 - 1791 on land belonging to Thomas Patching which was later leased to Friends at a peppercorn rent for 2,000 years. 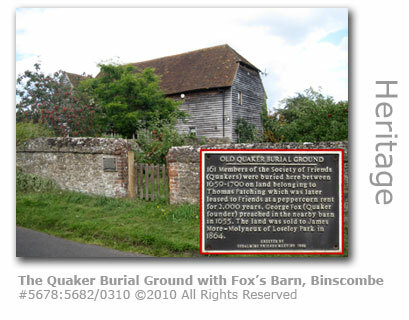 George Fox (Quaker founder) preached in the nearby barn in 1655. The land was sold to James More-Molyneuxof Loseley Park in 1864. The Tithe Map of 1844 shows a dozen houses in the hamlet, with the largest landlord for the properties and outlying fields being James More-Molyneux of Loseley. By 1915 only 21 householders were listed in the Craddock's Godalming Directory. And so the hamlet remained isolated until 1950 when Godalming Borough Council bought a large proportion of the agricultural land of Binscombe Farm under a compulsory purchase order and over the next 20 years the new Binscombe Farm Estate, which provided council tenancy to a rapidly growing local population, gradually encroached. In 1970 the hamlet was given official endorsement by the local authority to provide a postal address of Binscombe and the renumbering of the houses to endorse their geographical independence from Farncombe. The Evangelical Binscombe Church in Loseley Road was constructed on the new estate in 1965 with an extension added in 1969. Binscombe Junior School in Green Lane has capacity for 234 7 to 11-year-olds. The Surrey novelist John Whitbourn published a series of supernatural stories collectively known as the Binscombe Tales although it is doubtful as to whether the geographic name has any direct relevance other than providing the name. ONCE HAD ITS OWN SKATING RINK?